Special dangers await your cat during the Holidays. 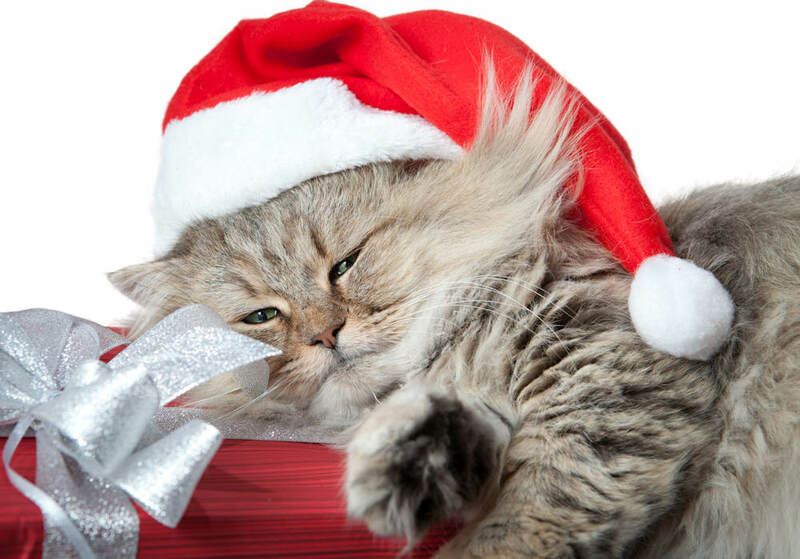 Thousands of cats suffer injury or become deathly ill and die each year during the Holidays. During this busy time of year, we often forget about our four-legged family members during all the Holiday festivities. Cats are just as curious and anxious about the Holidays as we are. New Year's - Be alert to any cat hazards such as noisemakers and confetti which can easily pose a serious threat to your cat. Noisemakers can frighten your cat causing the cat to bolt out an open door or window, or leap to a precarious area in search of safety. Costly veterinarian bills can be the result of cats eating confetti. Valentine's Day - Please do not forget the hidden dangers to a cat in those boxes of candy gifts and lovely bouquets of flowers you receive. Do not leave candy out - most cats love the sweet taste, especially chocolate. Chocolate can be fatal if eaten in large quantities or over a period of time. Easter - the colorful Easter "grass" used in baskets is attractive to cats. Goodies tucked in the baskets can be harmful to a cat's digestive system as well - chocolates, tiny Easter toys, etc. St. Patrick's Day - During festivities, cats and alcohol DO NOT mix. Alcoholic is toxic to cats. 4th of July - This is a day of terrible accidents and even abuse related to fireworks. Please keep cats indoors during the holiday and watch traffic at doorways. The sudden loud noises and flashing colors can cause your cat to run away. A carelessly thrown firecracker or other firework could result in a disfiguring or maiming tragedy. Unfortunately, animal abusers get their thrills by harming cats who are smaller, weaker and defenseless. Halloween - Cats should be kept inside during the night the kids are trick or treating, to avoid the heartbreak of hideous "pranks". In fact, all black cats should stay indoors during October. The safest thing for both you and your pets is to keep them indoors. Christmas - Hang ornaments which mean a lot to you higher on the Christmas tree. Use wooden, metal, resin-cast or the like on the lower branches in case curious little paws want to play with the bright, colorful ornaments. While tinsel is not toxic, if eaten, intestinal obstruction and choking are possible problems. Do not give any animal or cat, of any age, as a gift. Instead, give gifts of cat supplies, food, or accessories and let them get their own kitten. This will also provide the new cat owner the time to spend with their new lifetime commitment. Remember the first weeks at a new home is traumatic for cats. The gift to a no-kill shelter is a great alternative for those animal lovers with pet allergies, health issues, or work too many hours and have hectic work schedules to have a cat. For a list of "no-kill shelters" in your area, please visit the nøKill Network website for more information. actually would want to…HaHa). You certainly put a fresh spin on a topic that’s been written about for a long time.